One of the many things I love about Cebu is how the beaches are literally minutes away from the city. This is what a city boy like me dream of. Go to work, run a few errands, go to the beach, watch the sunset and maybe have a couple of drinks. When it gets toxic at work, I can just hop in to my car and drive to a nearest beach. Off Mactan are several beautiful islands having stretch of white sand beaches and a 4-5 hours drive would take you to more white and powdery beaches. Sumilon and Oslob to name a few. Damn, Cebuanos are lucky. I go to Cebu a lot and most of the time it’s for work. I usually just stay overnight and don’t mind the hassle since it’s only an hour away from Manila by plane. In my recent trip to queen city of the south, I made sure to extend my stay for a quick little vacation at Shangri-La Mactan Resort & Spa. I heard so many good things about it so I booked a 2 night-stay in the resort. My quick stay at Shangri-La Mactan had one of those rare moments wherein I didn’t want to leave. If you know me well, you would know that I’m a complete workaholic and “extending” a trip is not in my vocabulary. Maybe the place was too huge for one to explore. I arrived at the resort a little late in the afternoon so technically, I only had one full day to see what the resort has to offer. Nevertheless, Shangri-La Mactan did not only meet my expectations, it surpassed them. 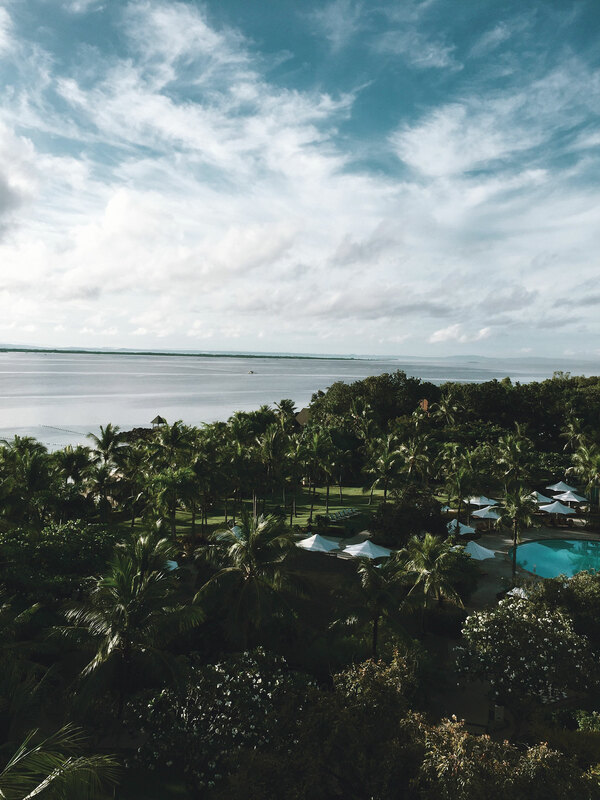 This is why I made a short list of 10 reasons why you should book a vacation at Shangri-La Mactan Resort and Spa! I think I would’ve gone overboard and give you 30 reasons if I had photos to back it up or if I had another extra day to explore the resort. Oh well, I’ll make sure to come back and stay a little longer next time! 1. The resort is freaking huge – Upon checking in at Shangri-La Mactan, the friendly (multilingual) staff handed us with a map. We only stayed for 2 nights and we didn’t get to explore the other parts of the resort. Yup, it’s that huge! This Shangri-La property likes in 13 grassy acres of tropical, beachside gardens. I don’t mind getting lost here! This is the view from our room by the way. You get a gorgeous view of the Visayan sea too! 2. 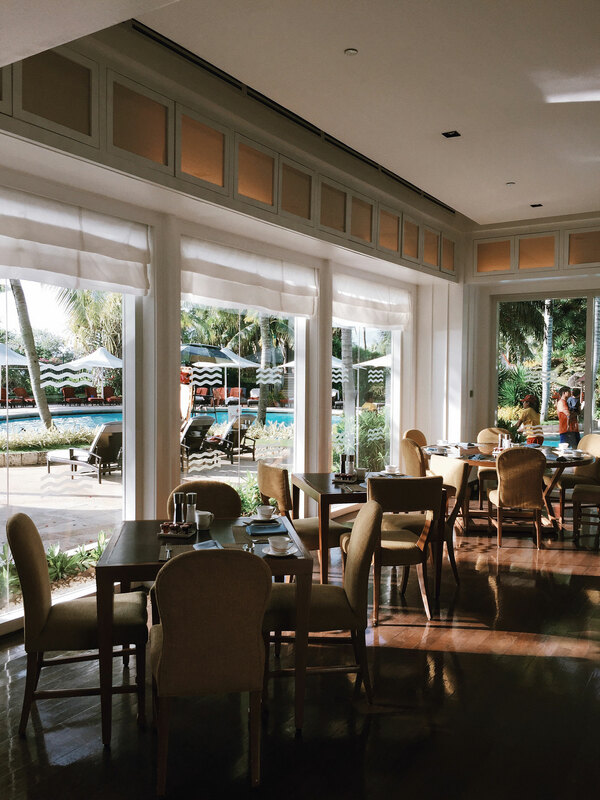 Food to die for – One of the things I will never forget about my short stay in Shangri-La Mactan is the food. I got to try the food at Cowrie Cove (seafood), Acqua (pastas, risotto, etc) and Tea of Spring (Chinese cuisine). 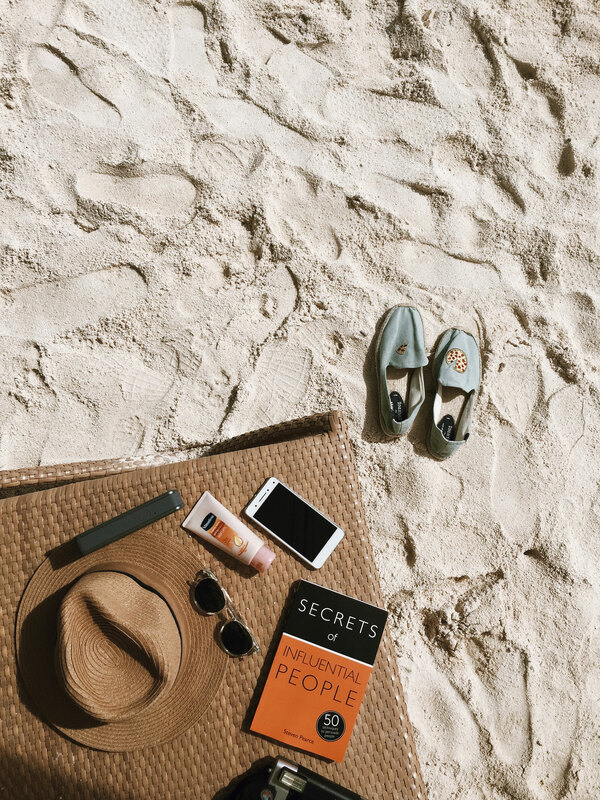 For added experience, try booking one of the 12 secluded outdoor cabanas. I was able to book one during Valentine’s Day (2 months in advance lol). You can read my experience here. 3. 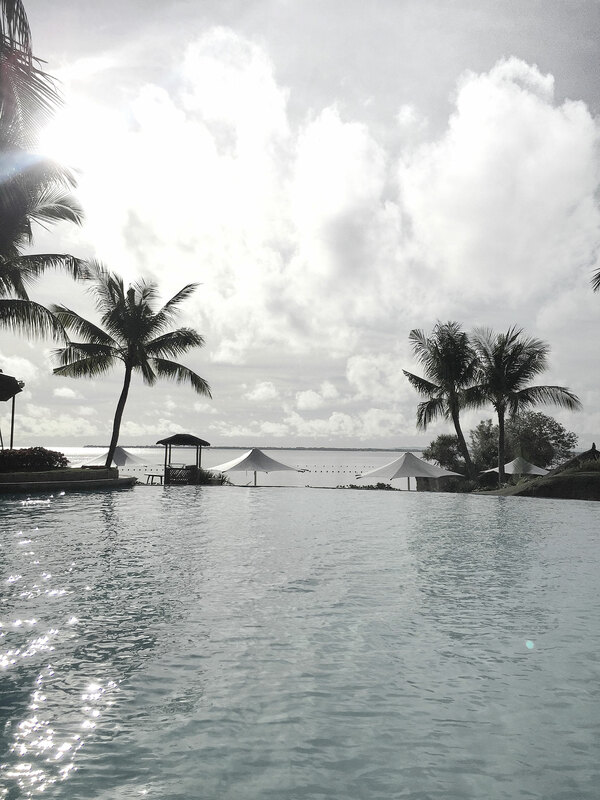 Swimming pools everywhere – I couldn’t even count how many swimming pools are there in Shangri-La Mactan Resort and Spa. There is something for the whole family. There are slides, a basketball court, a lap pool, etc. I kept telling Vina that my nephews and nieces would love it here. My personal favorite is this pool near the beach and across Acqua. It’s a gorgeous infinity pool that extends to the Visayan Sea. 4. Pick any spot you like in the resort and you will find a hammock – Even though I was so tempted to just stay in my room the whole time, I couldn’t help but notice the amount of hammocks and lounge areas in the resort. You can take a nap, read a book or just chill in one of the many hammocks scattered around the resort. 5. 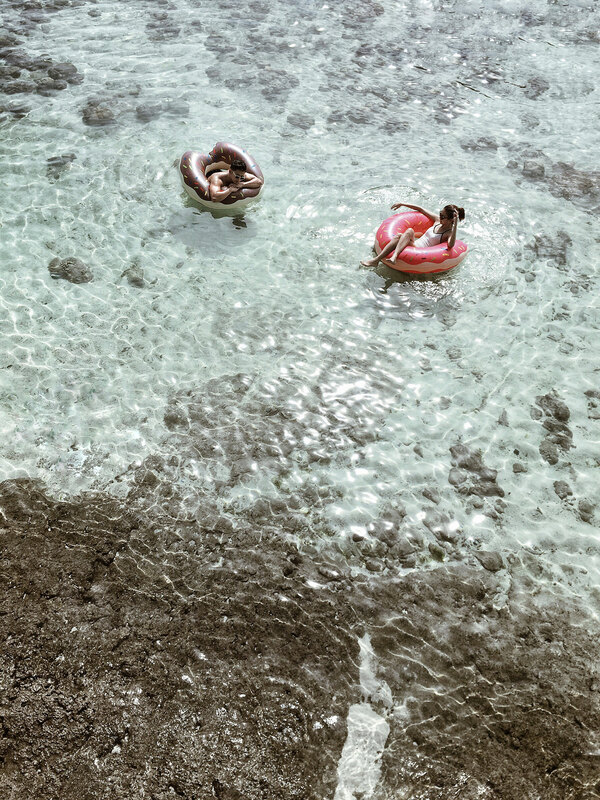 Turquoise waters – I love the beach at Shangri-La Mactan, a bit rocky but I enjoyed swimming because of the beautiful waters. I love the fact that there are a bunch of rock formations which kind of makes it seem like there are divisions in the beach. You feel like you have the beach to yourself! The only sad things is that you won’t get to see the sunset from here, you will see it at the golf course area. 6. 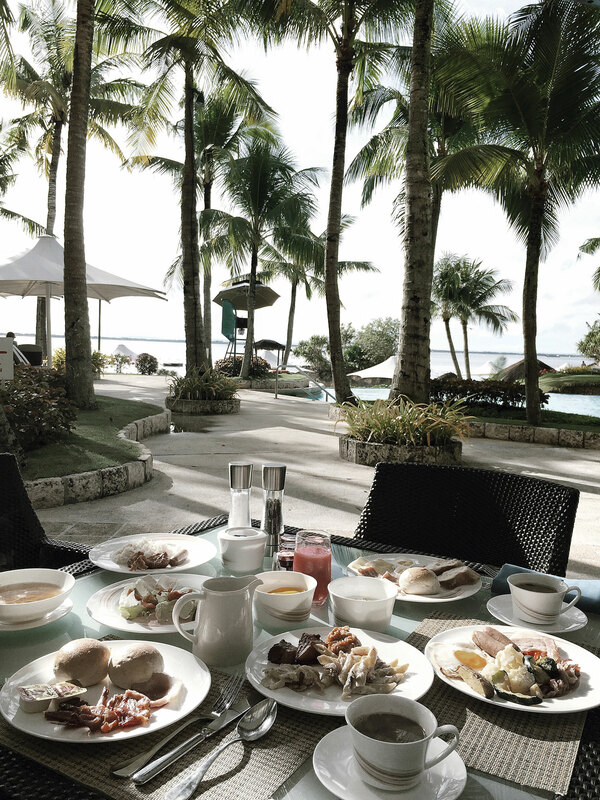 Breakfast with a view – Another thing I love about Shangri-La Mactan is that you can choose which restaurant you want to have your complimentary breakfast in. I personally love Acqua because of the wide selection of bread, pasta, pizza and juices. I also love eating outside to get a gorgeous view of the infinity pool and the beach. 7. 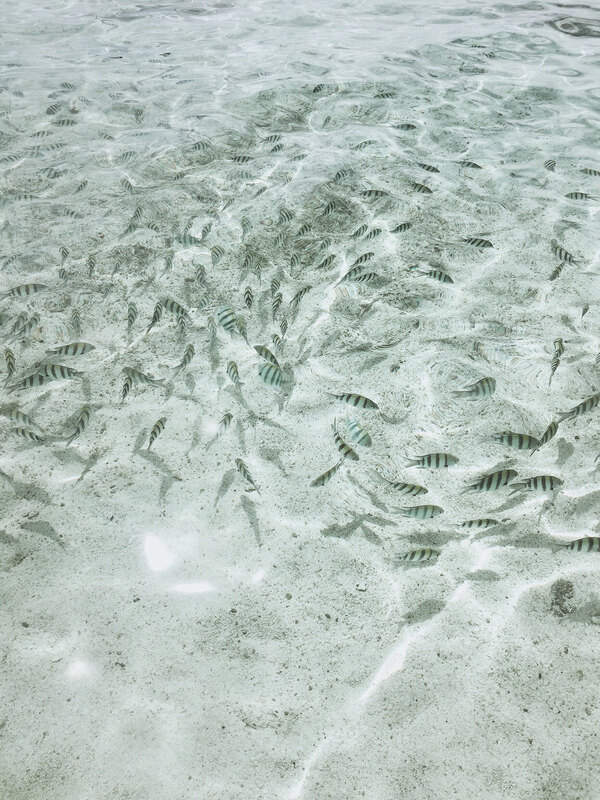 Swim with the fishes – I was ecstatic when I saw a school of fish swimming close to the shore. They’re so beautiful! You can also feed them, just ask the staff and they’ll give you free fish food! 8. 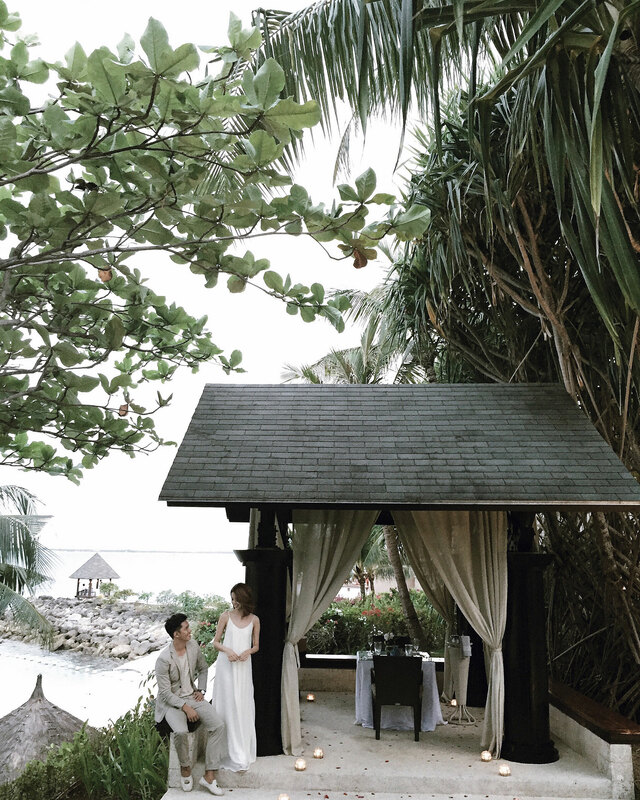 They have private outdoor cabanas – Shangri-La Mactan Resort & Spa is one of the most sought-after dining destinations in Cebu. When Vina and I went there for Valentine’s, we were surprised with the amount of guests (locals and tourists) in the restaurants. We were lucky we got to book this beautiful private outdoor cabana at Cowrie Cove. If you’re thinking of booking a stay at Shangri-La, make sure to experience this! The place is so romantic without even trying–and I’m sure a lot of proposals took place here already. Haha! You can read about my Cowrie Cove experience here. 9. They have crazy fast wifi – Haha I just had to include this on the list because I am very particular about this! According to my Cebuano friend, Shangri-La Mactan is quite known for their fast wifi connection. I was impressed considering how huge the resort is–I got a strong wifi connection all throughout! This is why I flooded you guys with Instagram photos and snapchat videos during my trip! 10. 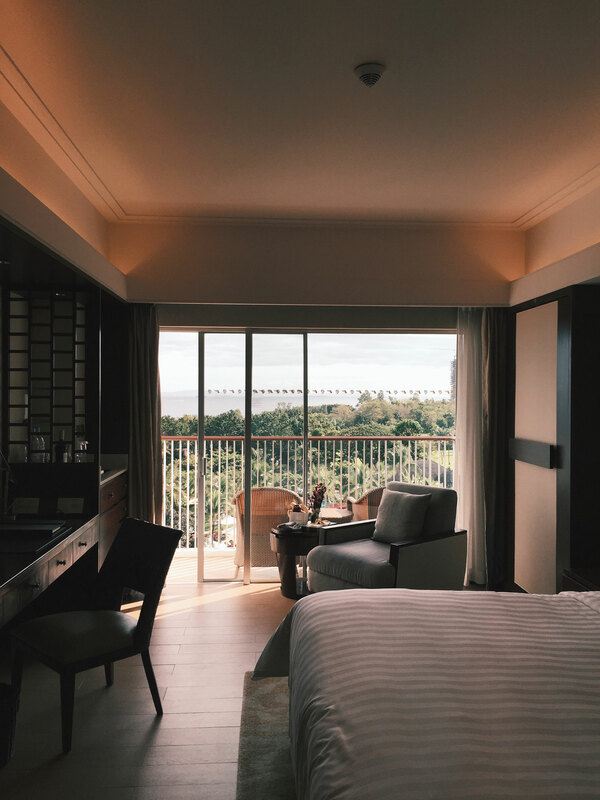 I had the best sleep of my life – I’m not even kidding when I tell you that I would sleep for a good 12 hours every night during my stay in Shangri-La Mactan. 12 hours! I was sleeping like a baby every night haha! Maybe there’s something in their beds that make their guests (or maybe it’s just me lol) fall into a deep sleep. It can also be the golden brown and turquoise color tones of the room–which gives us the feeling of being on the beach, close to the crystal blue waters of Mactan Channel. 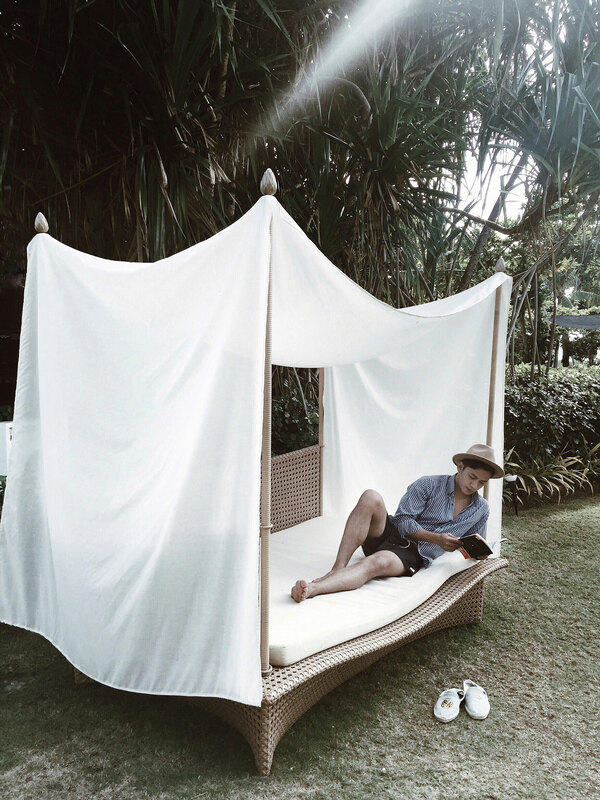 Glad you were able to visit Shangri-La Mactan, David! Thanks Jean! See you soon in Cebu! See you! Let us know when you’re here so we can hang out with sila Marco! Waaaahhhh, I think one week isn’t enough for you to explore this place! So beautiful! Gosh! The resort is beautiful. But how’s the price, David?